In today’s article I’m going to reveal 15 ways to make $2000 in a few days. Well the only catch to make $500-$2500 in a couple of weeks is that you have to invest your time and effort. Some of the below ways to make money are also long term money making strategies, which is great! I’ll try to focus on ways to make quick cash, since I know making quick money is why you are here! If you would have told me 2 years ago that you could make money filling out online surveys, I would have though you were crazy. Companies will literally pay for your opinion and time. And it makes sense, when you think about. Companies need your input and opinion to help figure out if their products are legit. If you match an “ideal customer” profile, you could be picked to fill out an opinion survey. I don’t know about you, but I’m not going to fill out a survey unless I have a chance to win something…MONEY in this case. You can easily make about $8-$12 an hour filling out paid surveys. You’re not going to get rich filling out online surveys, BUT you could make some quick cash in a pinch. Some surveys pay a few bucks and other longer surveys have been known to pay $50-$75. Ready to find out where these magical online paid surveys have been hiding? Sure, this isn’t a way to “make money,” but it’s a quick way to “find” some cash. I know when I’m looking for ways to add some cash to my bottom line I look at some of my expenses I can cut off. Cable bills, cell phone plans, not eating out as much, etc…Remember, anything goes that isn’t a NECESSITY! I switched to Netflix and Hulu, cancelled my cable and saved about $50/month. Learn to say no when you have to and commit to making smarter financial choices, even if it’s skipping your $5 morning latte. Interest stinks, BUT we all need a loan every now and then. So a great way to “make money” is to reduce your interest rate on any existing loans you have. The 3 most common loans we have are home loans, auto loans, and student loans. Similar to the money making online paid surveys you can download all kinds of apps that help make or save you money. Some apps give you cash, others give you gift cards, which is just like having cash. That feeling when you wake up about you’ve made $20 or even $200 while you were sleeping is one of the best feelings in the world. I know, starting a business is scary and maybe you don’t think you’ve got what it takes to run your own company. The truth is, anyone can start a blog from scratch with zero little initial investment. The key to a successful blog is consistency, commitment, and monetization. There’s definitely things you need to learn in order to be a successful blogger. If you want to make an extra $500, $1000, and even $5000 every week for the rest of your life, then blogging is for you. The start up costs are incredibly low and the potential returns are never ending. There is literally NO cap on how much you can make from blogging. One of the most common ways to make money right away is to take out a loan. If you’re in desperate need for 500-2000 dollars then you can consider taking out a loan. Since it’s “only” $500-$2000, it should be manageable to pay back no matter how bad your financial situation is. Just make sure you understand the terms and conditions of repayment before you pay it back. Before you take a personal loan out, ask yourself if you REALLY need the money. If you want a loan to start a blog, take some classes, or something that helps you grow in life, then go for it. If you want a loan to take your girlfriend on a vacation or for a down payment on a car you can’t afford, then I wouldn’t advise that. In other words, if the money is making you money, then do it. If it’s losing you money, then don’t do it. Loans are popular and if you are interested in getting a loan online at reasonable interest rates, check out lendingclub.com. Holding a garage sale is an easy way to get rid of stuff you aren’t using (i.e declutter) and make a few bucks while you’re at it. Win-win-win! Just like holding your own garage sale, you can also sell your used stuff online. It takes a bit of time to list items, but if you have some decent stuff that people want, people will find it online. If you have any bigger ticket items you’ll find it easier to unload it for the $250, $500, or even $1000 if you have some valuable electronics. It all depends on how bad you need the extra money. Write a book! Yeah right, I failed English. Listen, I was HORRIBLE at English, especially when it came to writing papers. 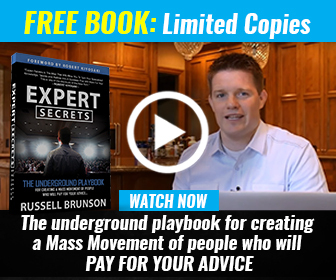 Believe it or not, I’ve written over 20 ebooks and I’ve created 7 online courses and programs. People email me complaining ALL of the time about my grammar, writing skills, and horrible spelling. Do I care? Well yes, a little. Did it stop me? Nope! Unless you already have a huge following it’s going to take some time to start seeing REAL money, but be consistent and you can make a career out of writing. You can also start your blog and start selling an online course about literally anything. One of online mentors, Russell Brunson, CEO of ClickFunnels started his first business selling potato guns! I hope you enjoyed reading about different ways to make $2000 or more in 2 weeks! I some of these suggestions are overwhelming and intimidating, but I believe in you! Just start somewhere and start seeing some little wins and that will give you some motivation to keep going.